Other than mangoes produced in Depaha Village, District Kubutambahan, Buleleng has komuditi local fruit that is able to penetrate overseas markets. Bali local fruit was none other than the mangosteen. Fruit with a sweet taste slightly sour mix, many resulting in several districts in North Bali. Until this year, local mangosteen Bali produced by farmers in the village of uploads, District and Village Seririt Bongancina, District Busungbiu exported to China. 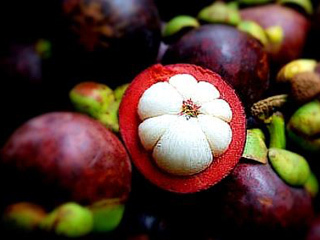 Mangosteen spread widely cultivated by farmers in the District of Sawan, Seririt, Banjar and District Busungbiu. The villages producing mangosteen as Lemukih Village, Galungan, Bebetin, Sekumpul and Village Bebetin (District of Sawan). Cempaga village, Pedawa, and Tigawasa (Banjar District). Upload village and Village hose (District of Seririt), and Village Bongancina, Subuk, and village Tista (Subdistrict Busungbiu). Since the first farmers to cultivate mangosteen with mono cropping system culture or commonly called intercropping. That is, mangosteen planted to crops interrupters in one area of the garden. Although mono-culture cultivation system, apparently the production of this komuditi bsia be high. Recent data in 2014 where the total population, there were 59 762 trees plants capable of producing as many as 1,915 tons of mangosteen. Head of Division (Head) Horticulture I Gede Sebudi, SP permission of the Head of Department of Agriculture and Livestock (Distanak) Autonomous Nyoman Buleleng in his office, Friday (10/04/2015) says, of some villages producing it for a while mangosteen mangosteen produced in the village and in the village Bongancina uploads are penetrating into the export market . While other villages that its production is sold in the country. “From our data collection is mangosteen in these villages were exported.